If there’s anything I’ve learned about myself over the last several years, it’s that my moods tend to vary by season. Fall is contemplative and expectant. Summer is calm and relaxed. December is cozy and peaceful. And February is. . . hard. With the exception of 2015 (when I was still riding the high after Charleston’s birth), February has generally been a month dominated by depression and anxiety (for me, and I’m sure many others too). I always forget that it’s coming, but then the compounding factors of winter blues and post-Christmas hangover and pre-birthday trepidation creep their way into my psyche and do their best to take me out. 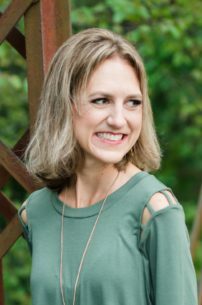 My instinctual reaction is to ignore these feelings and press into the busyness that also tends to dominate this month, but as an introvert who needs a lot of personal down time, that is generally a recipe for disaster. All that to say that these past few weeks have been emotionally difficult ones for me. However, as I already noted, my moods tend to vary by season. And the dawn of spring has been known to be a harbinger of brighter moods and renewed perspective. I know that the dark moments will be over soon, that this too shall past, that before long I will be as good as new. In the meantime, I’m thankful to be surrounded by caring people who are supportive and encouraging, and willing to wait out these dark days right along with me. And that, my friends, is the biggest thing I’ve learned and am still learning this February—or, at least, something I’ve learned in the past and am reminding myself of once again. There have of course been other factoids and insights that have crossed my path this month. Some from the school of hard knocks, others through more conventional means such as things I’ve read in passing, or even intentional research. 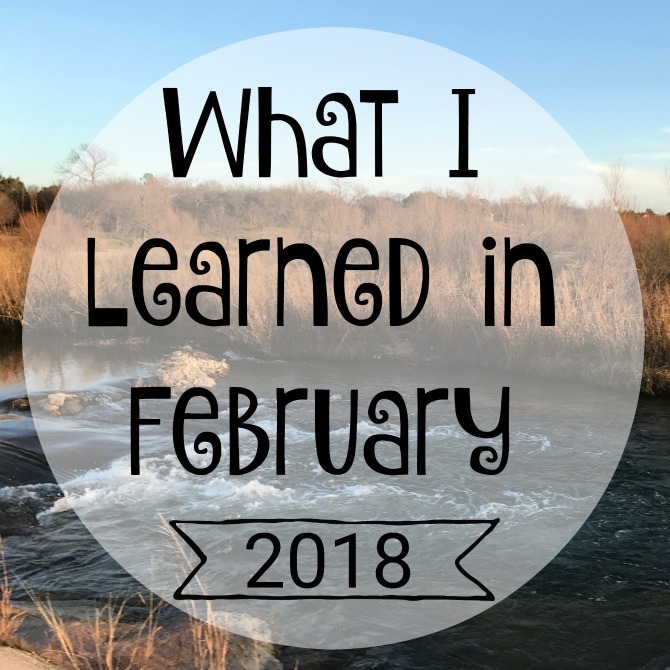 Here’s a snapshot of some of the more memorable things I learned in February. 1. Hygge isn’t just a marketing stunt. I enjoyed reading about the Danish concept of hygge and have benefited from implemented hygge concepts in my own home and life. However, I’d cynically assumed that the concept was an obscure Danish term that had been overhyped for American audiences. That is, until a few weeks ago, when our landlord’s wife (who is from Denmark) was at our house and I took the opportunity to ask her about it. She assured me that hygge—both the concept and the term itself—is a prevalent part of Danish culture. Just knowing that it’s a REAL thing made me feel so warm and fuzzy inside! 2. Being rich is the activity of creating more than you consume. This definition came from our pastor during a recent sermon on materialism, and he suggested it as an alternative to society’s traditional view of wealth as “arriving at a place where I have more money than ideas.” Within this new definition, priority trumps activity; margin trumps more; and generosity trumps greed. In other words, it flips our culture’s views upside down. And when we do that, the pursuit of money ceases to dominate our lives. I’ve been thinking about this a lot lately when I find myself settling into a scarcity mentality. 3. The USDA played a role in the sizing of women’s clothing. 4. Time is the most common noun in the English language. I was at first surprised when I came across this statistic in this book, but after reading the author’s explanation, it makes sense. He writes, “[Time] is one of the most expansive and universal words we have. [It] can signify a discrete duration (‘How much time is left in the second period?’), a specific moment (‘What time does the bus to Narita arrive?’), an abstract notion (‘Where did the time go? ), a general experience (‘I’m having a good time’), a turn at doing something (‘He rode the roller coaster only one time’), a historical period (‘In Winston Churchill’s time. . .”), and more.” Since reading this I’ve been cognizant of how frequently I use the word aloud, and even how often it comes up in my thought life. 5. Rinse out clothing stains before treating them. 6. 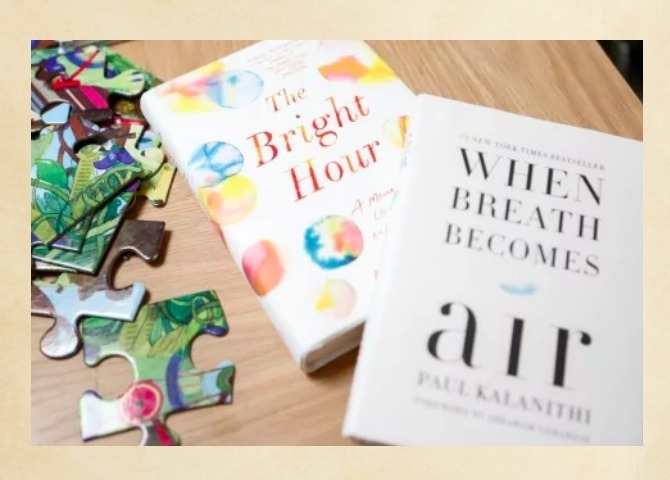 Paul Kalanithi’s widow has the most amazing second love story. When Breath Becomes Air was one of the best books I read last year, but also one of the saddest. I was inspired by Kalanithi’s story but devastated for the young wife he left behind. Which is why I was overjoyed to read that Lucy Kalanithi has found love with the widower of another memoirist who wrote about the end of her life. The story is almost too beautiful to be believed. 7. Crazy straws are not dishwasher friendly. Please don’t tell Charleston that his beloved heart-shaped straw was a casualty of this lesson. 8. Fanny packs have been rebranded. Apparently they are now known as “belt bags.” If you are a fan of fanny packs—excuse me, belt bags—no judgment here; they just aren’t my thing. The iridescent nylon number I rocked on my Disneyland visits in the summer of ’92 has left me permanently scarred, and no amount of name-changing wizardry can scrub that fashion disaster from my memory or prompt me to give the trend another go. 9. My celebrity look-alike is someone I’ve never heard of! I was talking celebrity twins with a group of ladies a few weeks ago, and realized I’d never been told I looked like anyone famous. 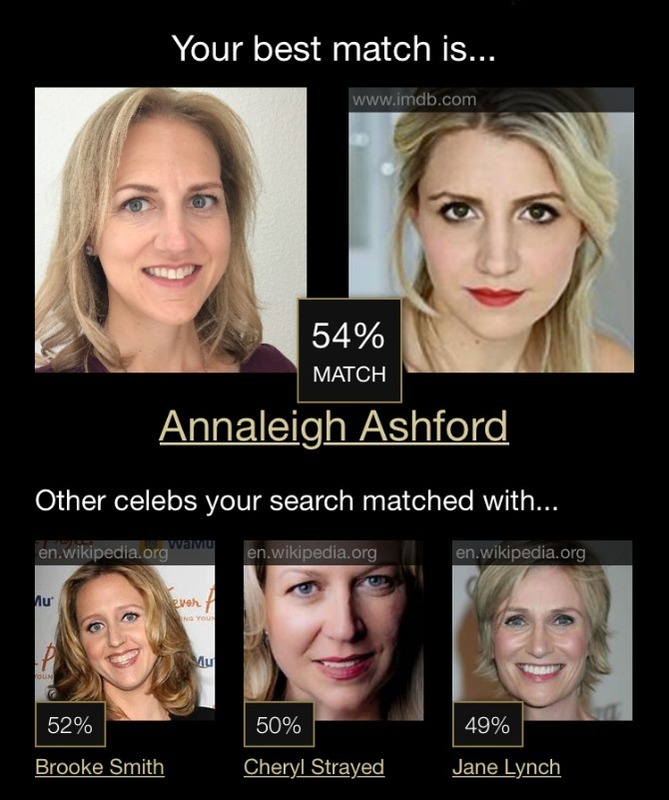 So I ran my image through a generator and was matched with Annaleigh Ashford (???). A quick Google search told me that she is known for her Broadway performance as Glinda in Wicked, so I suppose I could do worse. I’m not a fan of my second runner-up match (her memoir ranks among one of my least favorite reads of recent years), but #3 match Jane Lynch is pretty awesome, as long as I forget the fact that she has a few decades on me. 10. I really need to preview picture books myself BEFORE reading them with my child. We own hundreds of picture books, and we read them often, but there’s still something fun about getting new-to-us books to read from the library. We check out a new stack of books at least once per week, and since it isn’t easy to look for books while also keeping an eye on Charleston, I don’t generally put too much time or attention into making my selections; I just grab my books, have Charleston help me with check out process, then stick them in a bag until we get home and we read them together. 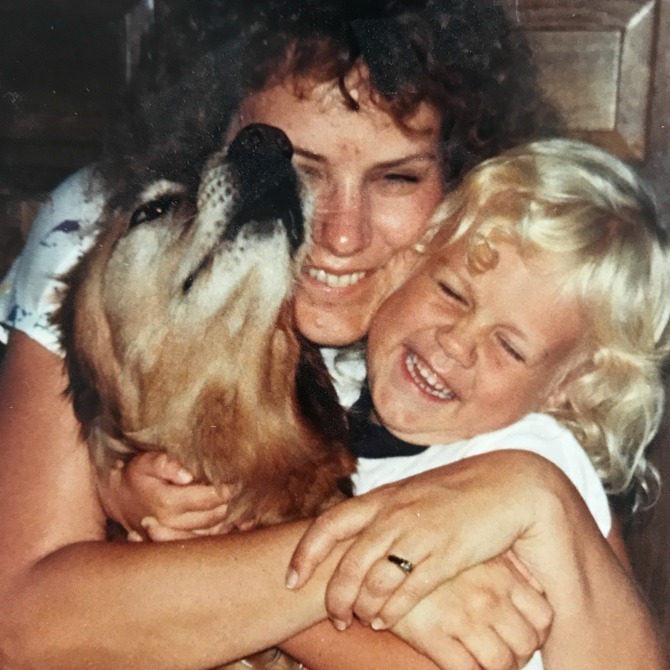 I’ve mostly had good luck with this haphazard method, but last week revealed to me that I might need to pay a bit more attention when picking books: we were reading through a sweet story about a boy and his dog. . . and then, right there in the middle of the CHILDREN’S picture book, the dog died! I was not expecting that plot twist and had not prepared for the conversations it would lead to. I have no problem with some sadness in children’s stories, but I do like to be able to gear up for it. From now on I read (or at least skim) the books on my own before reading aloud. 11. There is strict etiquette regarding when to fly the American flag at half-staff. With all the tragedy our country has seen over the last few years, it seems as though the flags in our town have been almost permanently kept at half staff. I was curious as to whether there were official guidelines regarding half-staff etiquette so I did some research. According to the Flag Code, “the flag shall be flown at half-staff upon the death of principal figures of the United States Government and the Governor of a State, territory, or possession, as a mark of respect to their memory.” The president can also issue an official proclamation ordering flags to be flown at half-staff for a time of remembrance or mourning. This website is dedicated to half-staff notifications. 12. 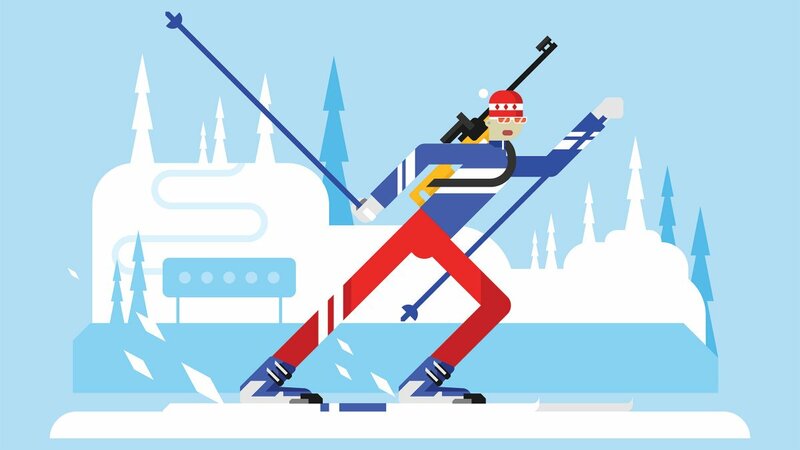 Some Olympic sports are a lot harder than they look. 13. You can sync your Goodreads and Kindle accounts. Maybe everyone else already knew this, but it was news to me, and it’s definitely my favorite discovery of the month (possibly even the last few months). I’m sure there are other benefits, but the big one for me is that now all of my Kindle highlights can be found on my Goodreads account. I’ve kept mine private, but you can even make them public if you choose to. This is a big deal for me because: 1) easy highlighting is one of my primary reasons for reading eBooks over paper books and 2) most of my eBooks are borrowed from the library, which means that my highlights disappear once I return the book. My previous workaround was to email my highlights to myself after finishing a book, but that was tedious and made it hard to go back and look for quotes. This new method appeals to both my bibliophilia and my OCDness! 14. Charles Darwin and Abraham Lincoln were born on the same day. This mind-blowing fact is courtesy of my Page-a-Day Trivia calendar. It had never occurred to me that these two historic icons lived within the same time period, let alone shared a birth date (April 12, 1809). 15. I’m a dog-naming hypocrite. I’m linking up with Emily Freeman to share what we learned this winter. What is something you’ve learned lately? I’d love to hear about it!